Zula, a startup from Jeff Pulver, a co-founder of VoIP success story Vonage, and serial entrepreneur Jacob Ner-David, is hoping to make your life a little less reliant on your inbox. The app combines elements of enterprise collaboration and communication tools, as well as mobile messaging giants like WhatsApp, for a tool that targets enterprise but could also find a home with personal users as well. The team’s priorities seem to have shifted slightly since the last time Zula popped up on our radar — at the time the Zulians were informally referring to themselves as working on a WhatsApp for businesses, but these days they’re much more amenable to the notion of opening up the app to the masses. Today’s Zula isn’t a purely business play, as the team now looks as it more as tool for teams of all sizes to communicate more effectively. It certainly doesn’t hurt that the app itself is really rather handsome, too. The UI is remarkably clean and free of nearly all visual clutter, and it seems as though very design choice made here was for the sake of reducing complexity. The end result is an app that looks good and works well. But what does Zula actually do? All of this communication hinges on the concept of the eponymous Zula, a group to which you can invite friends from your phone’s contact list, Facebook, LinkedIn, or Google account. And of course, there’s no upper limit to the amount of Zulas you can create (if you’re willing to pay, anyway), so users are welcome create groups that are as granular as they need. Once those comrades have been added to the fray, all the usual accoutrements are present and accounted for — they can start chatting away in the main stream, and it’s trivial enough to fire off photos into that main Zula river. Users are also able to call out individual Zula members with a Twitter-style @ mention, and effectively “shout” messages to catch the attention of the rest of the team’s participants. Missed out on one of those sweet, sweet cat images that pepper your team’s conversations? Every bit of media that gets sent to the Zula group is archived for posterity. Given co-founder Jeff Pulver’s history as co-founder of Vonage, it comes as little surprise that Zula also plays home to some dead-simple VoIP functionality too. It takes a single touch to rope every member of a Zula into a conference call, and a few quick swipes lets people call others who have been added to the Zula group. All of Zula’s competitors are focused on corporate users, the company told us, whereas Zula is open and doesn’t discriminate. “Unlike certain apps, Zula doesn’t require you to know each other personally,” Pulver explained in an interview. “WhatsApp needs you to know each other’s phone numbers. We let you call each other without phone numbers.” Invites go out over connected social media accounts, and once invitees sign up, they’re pulled directly to the conversation they were invited to specifically. Zula is making its official debut on iOS, with the app currently in Apple’s review process and approval pending at any moment. They’ll also target Android shortly, and eventually HTML5 and web, too. Originally, Pulver said he’d hoped to build a product that was mobile-only, but after testing and gathering feedback from clients, especially those who are business users, it became apparent they’d need some kind of desktop client as well, so that’s in the works for down the road. Eventually, the goal is to make Zula into a platform that others can build applications on top of. So conceivably you could have collaborative apps that run in Zula groups, allowing participants to interact with other services and features without ever leaving the Zula app itself. It sounds like it could resemble what Kik has done with Cards, and potentially provide some revenue opportunities. Zula’s revenue model is a freemium one not unlike other enterprise startups, so that you get access to most of Zula’s features for free, but will have to pay to unlock some things, like recording conference calls, hosting a large number of Zula’s, or having more than 16 people on any one Zula. It’s a tried-and-tested approach to an enterprise offering, and one that should suit well its ability to appeal to both consumers and larger organizations. Pulver has a track record that shows he’s savvy about communication, with an early success in the now-crowded VoIP space. Ner-David has also built a successful VoIP company, called Delta Three, which managed a nearly $1 billion IPO. 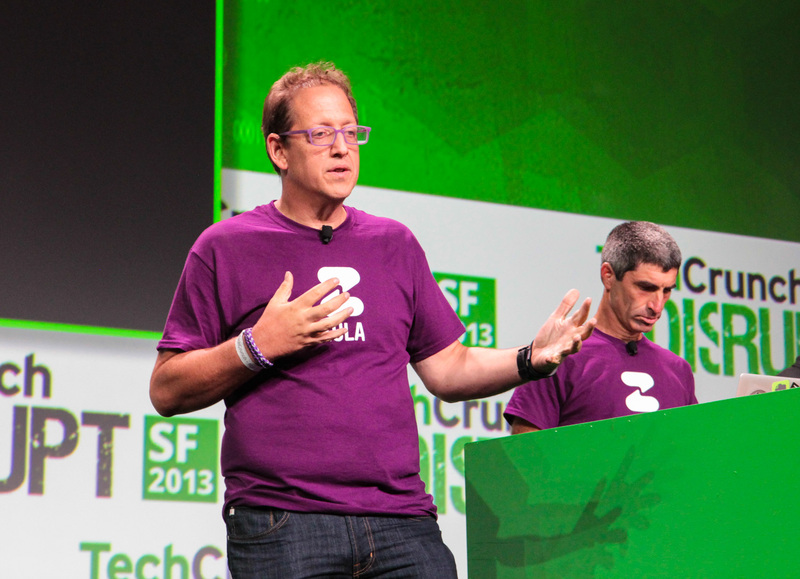 Zula has raised $350,000 from angel investors, founder funds and Israeli crowdfunding platform OurCrowd. Tell us a little more about your team. The dev team is based in israel, while the headquarters are in New York. Jacob previously founded and sold Delta 3, while Jeff started Vonage and took it public. Tell me about identity that’s backing these logins — do they resolve into a Zula account? There’s a number of ways to create an account, but primarily you can create a separate Zula account or log in with Facebook or Google accounts. Is there a desktop client? Messages themselves are being stored on your servers — not sure I trust you yet, how do you protect that info? Will any zula employees ever see these messages? No, they’re siloed and compartmentalized. Freemium, planning low single dollar monthly subscriptions for features like call recording and increasing the number of Zulas you can create. Zula has also ready been approached about doing on-premise and white label stuff by potential partners.